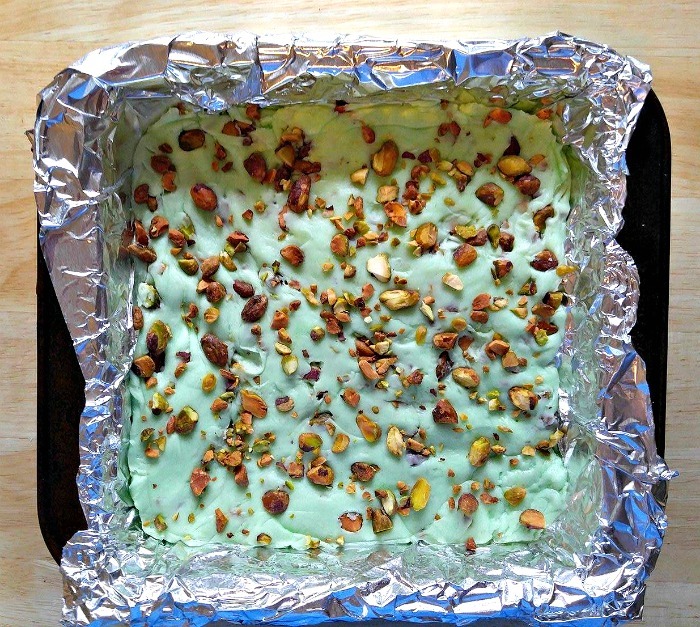 This rich and creamy Easy Pistachio Fudge is perfect for your special dessert table and makes a great holiday homemade gift idea. This nutty fudge recipe takes just minutes to prepare and sets beautifully every time. I have to admit it. I love fudge recipes. Every time I go to my local Farmer’s Market, I head to the indoor area where there is a vendor that sells fudge and buy a piece or two. I don’t often make this sweet treat at home, since I know I will devour the whole pan. But when the holidays roll around, I make every version that I have a recipe for. Home made fudge makes a wonderful Christmas gift and I love to have a variety of different types arranged in a pretty Christmas gift tin to share with friends and family. 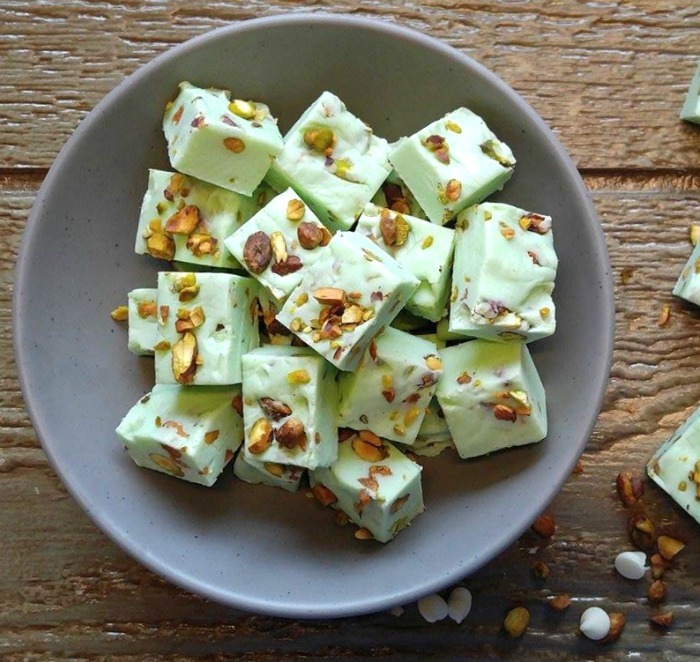 It’s time to make some Easy Pistachio Fudge! Gather the ingredients together. 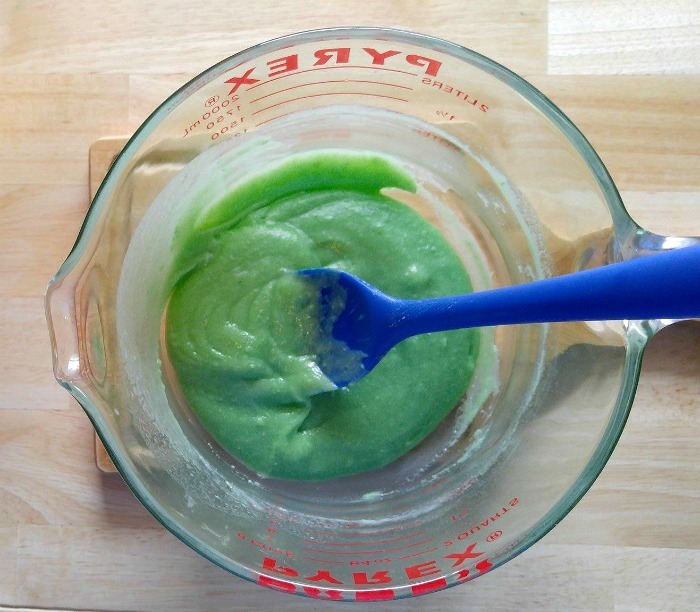 I love that the pistachio fat free sugar free pudding mix gives me the color that I want for my fudge without making it too green. It also helps the fudge to set well and makes this a fool proof recipe. The only cooking that is needed is to melt the white chocolate, butter and water in the microwave for a minute or so. How easy is that? No boiling, candy thermometers or time over a stove. Melt, stir, mix, pour into a prepared pan. 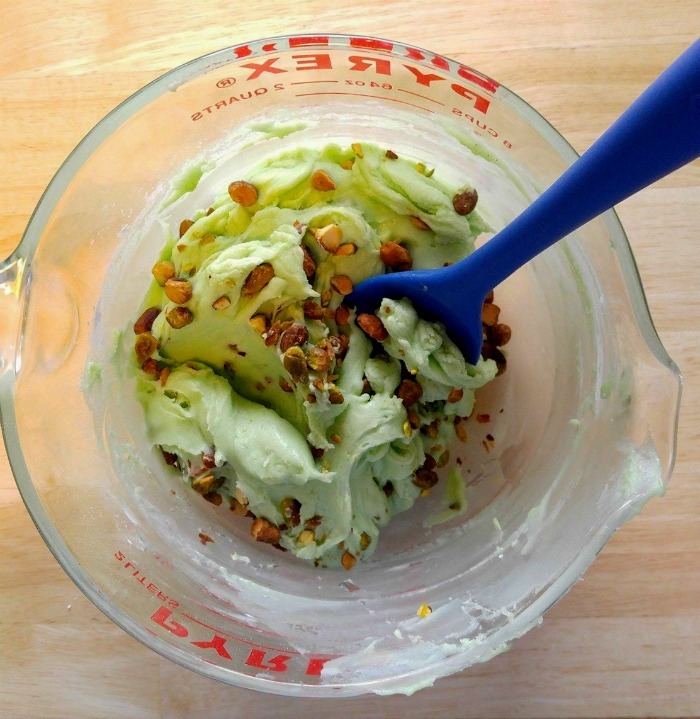 Once the butter and chocolate is smooth and silky, stir in the pistachio pudding mix. Next, the powdered sugar gets added one step at a time. TIP: This fudge is REALLY thick before it even sets. Using a hand mixer makes it easy to add the sugar. Otherwise you will get a cardio workout for the day! Roughly chop the pistachios so that the fudge will be filled with them throughout. I lined my pan with aluminum foil and give myself some extra to use as handles. This makes the nutty fudge recipe super easy to remove when it has set. Place the fudge mixture into the prepared pan and press it down firmly. A few extra pistachios pressed onto the top lets your guest know what the flavor is, and the fudge is ready to for the fridge. 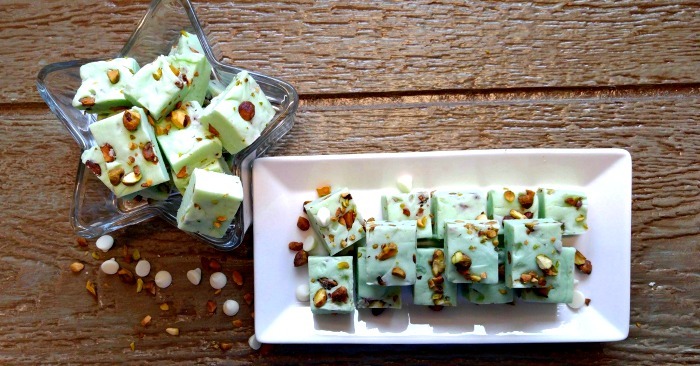 This Easy Pistachio Fudge sets wonderfully every single time. It is so festive looking, too! Cut it into about 30 squares with a sharp knife. Every bite of this nutty fudge recipe is a taste sensation that reminds you that the holidays are here! 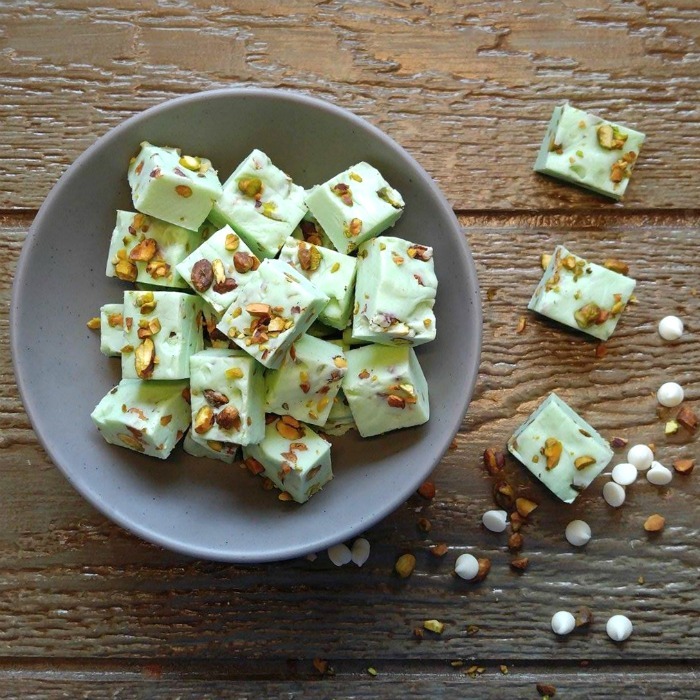 This Easy Pistachio Fudge has a creamy, nutty flavor and a pretty green color is perfect for holiday occasions or any special entertaining event. I love that it is ready to set in just a few minutes. It leaves me lots of time to do other things this busy time of the year! For more candy ideas, please visit my Candy Creations board on Pinterest. 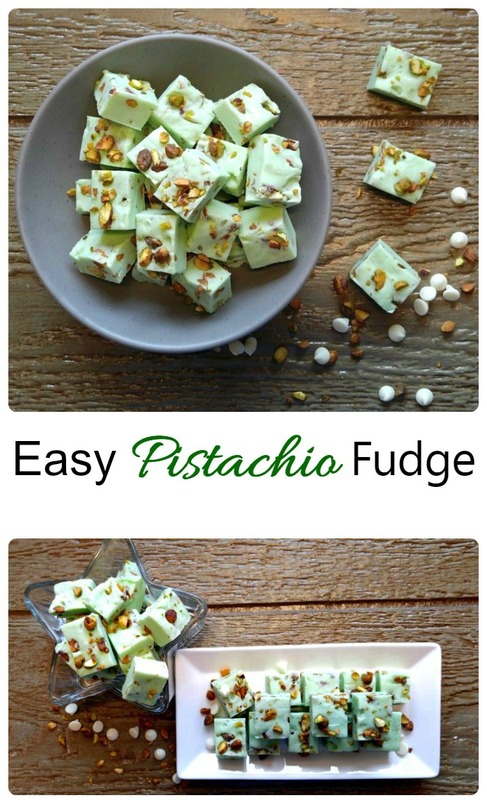 If you would like a reminder of this recipe for easy pistachio fudge, just pin this image to one of your dessert boards on Pinterest. 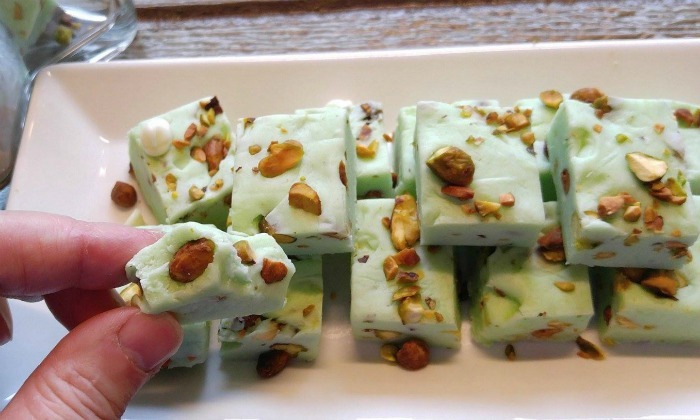 This rich and creamy Easy Pistachio Fudge is perfect for your special dessert table and makes a great holiday homemade gift idea. Line an 8 x 8" square baking pan with foil leaving some to overhang to use as handles later after the fudge is ready to remove. Set aside. 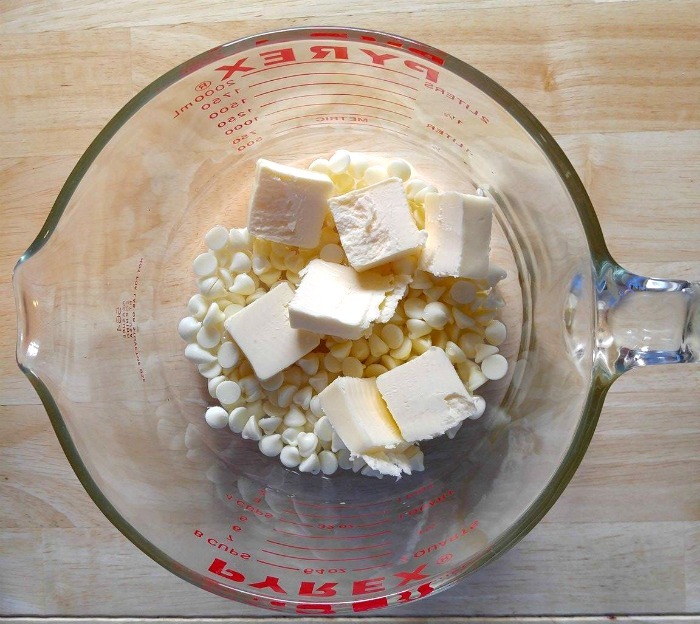 In a microwave safe large bowl, melt the white chocolate morsels, butter and water on high for 1 minute. Remove from microwave and stir until the white chocolate is fully melted. If needed heat for an additional 30 seconds or so until you get the smooth texture you want. Stir the dry pudding mix to chocolate mixture. 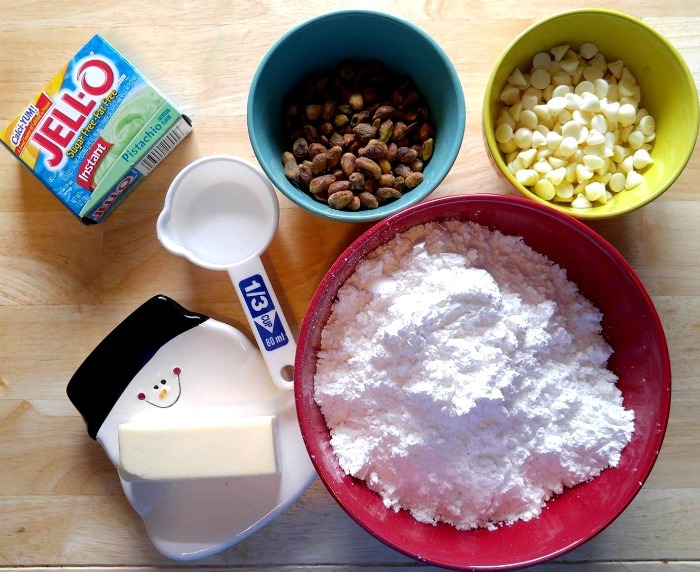 Once completely combined, use a hand mixer and mix in the confectioner's sugar, one cup at a time. (fudge will be very thick and hard to do by hand. 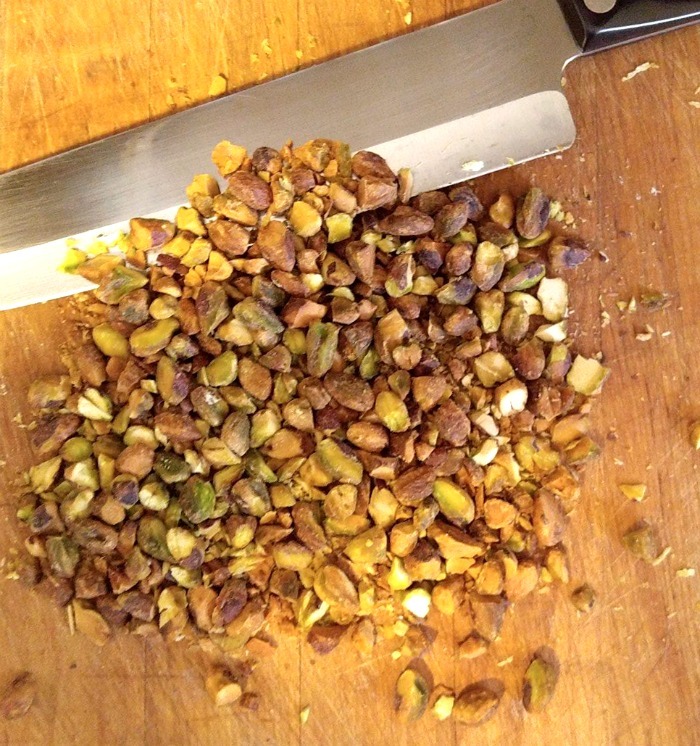 Roughly chop the pistachios. Fold in pistachios and garnish the top of the fudge with more chopped pistachios. Press the fudge into prepared pan. Refrigerate for 2 hours to set. Remove fudge from pan. Use a sharp knife to cut cleanly into squares. Store in an airtight container. Any suggestions on how much of the regular pistachio pudding that has sugar in it? How much to use so it’s not to sweet? Thanks! I used regular pistachio because I can’t eat fake sugar. I added some dried and crushed jalapeno for some kick. I also doubled the recipe. 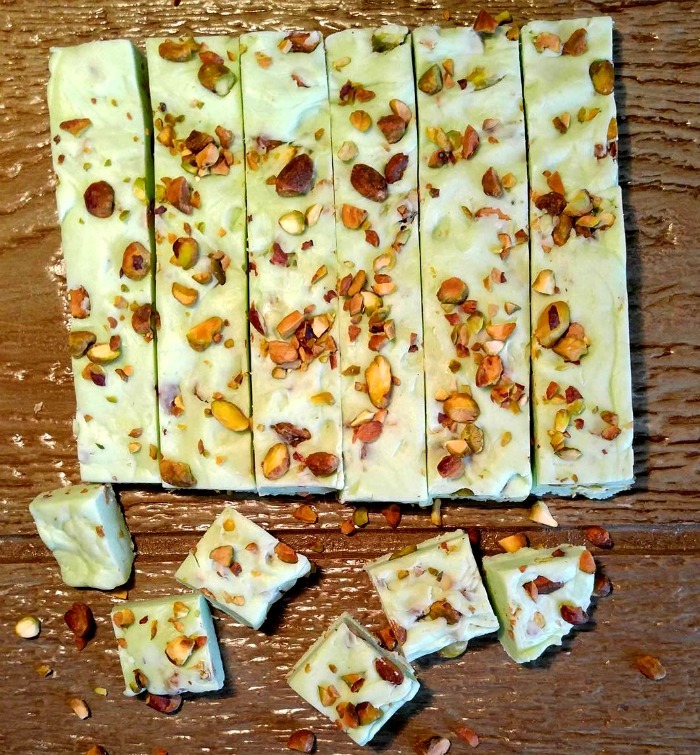 My pistachio jalapeno fudge came out really good, but I like to tweak. Next time I think I might cut down the amount of pistachio pudding so the jalapeno shines more. Maybe it was because I doubled the recipe that the flavor felt slightly stronger than I wanted. I agree with the OP you basically just want a hint of that green and pistachio. Instead of going with fat and sugar free, I think I can get that with less of the pudding package. I also think a little bit more butter would add a nice buttery undertone to it, not sure how that would affect consistency though (maybe cut an equal amount of water out). Anyway, this is a really good base for me to play with and super easy to make. Thanks. Does the fat free sugar free version of the pistachio pudding have the “diet” after taste, are there artificial sweeteners? I made it using the regular pudding and it sent me into sugar shock, but I loved the way it looked on my cookie platters last year. I have bought it at many different grocery stores here in NC but not all of them carry all the flavors. Amazon sells it in bulk.